George Eliot wrote these words in The Mill on the Floss in 1860. The art of travel literature has continued to flourish, and nourish, to this day. We could if we chose circumnavigate the globe many times over and along myriad routes, solely through the pages of books. But which route to take? Which writers to follow? Here, in the first installment of an occasional series, we will attempt to trace a route eastwards around the world from Greenwich in the company of some of the finest writers who ever crossed those continents. The journey taken and the authors selected will be by no means constitute a comprehensive guide to anything other than the joys of the meandering art of travel writing. We leave by boat from London, along the Thames, in the company of the celebrated and extraordinary Patrick Leigh Fermor. 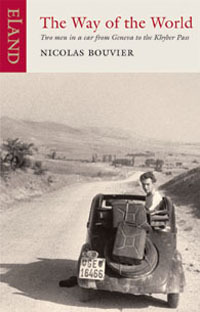 In December 1933, at the age of eighteen, he set out to travel to Constantinople, on foot and armed only with a bag of clothes and two anthologies of poetry, one of which was in Latin. His description, in A Time of Gifts, of disembarking from the boat in Rotterdam before dawn and striking out along the canals into the Dutch countryside is an irresistible beginning, filled with a sense of adventure, atmosphere and the strangeness of a foreign land. A shutter went up and a stout man in clogs opened a glass door, deposited a tabby on the snow and, turning back, began lighting a stove inside. The cat went in again at once; I followed it and the ensuing fried eggs and coffee, ordered by signs, were the best I have ever eaten…. I put on my greatcoat, slung the rucksack, grasped my stick and headed for the door. The landlord asked where I was going: I said ‘Constantinople.’ His brows went up and he signalled to me to wait: then he set out two small glasses and filled them with transparent liquid from a long stone bottle. We clinked them; he emptied his at one gulp and I did the same. Thus fortified by Bols, he begins his progression through Europe. His route takes him south through Germany where he demonstrates further the discrepancies between himself and today’s average 18 year old traveller. His German is poor and so it occurs to him that he ‘might learn the language quicker by reading Shakespeare in the famous German translation’. When his mind is not engaged with his surroundings, he staves off boredom by reciting his own private anthology of English, French and Latin poetry, an outline of which he details for us over three and a half pages. We can continue East with Leigh Fermor along the Danube, through Austria and Slovakia into his next book Between the Woods and the Water which will take us as far as the border of what was then Yugoslavia; by then, we may have grown a little weary of his lengthy elaborations on the history of every schloss and its inhabitants met on the way, and it is time to take up with our next guide. So, Yugoslavia. The country still went by this name when our next writer found himself there in 1953, twenty three years after Leigh Fermor. The Way of the World records the journey from Switzerland to Quetta on the Khyber Pass undertaken by Nicolas Bouvier, born in Geneva in 1929, and his artist friend Thierry Vernet, two years his senior. 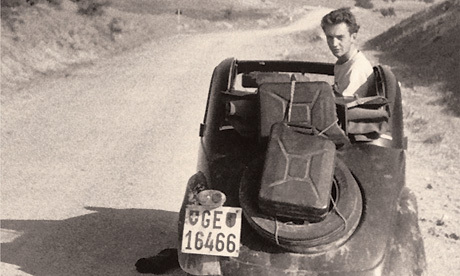 In a Fiat Topolino, which is probably about as unsuitable a vehicle for such an expedition as you could possibly choose. 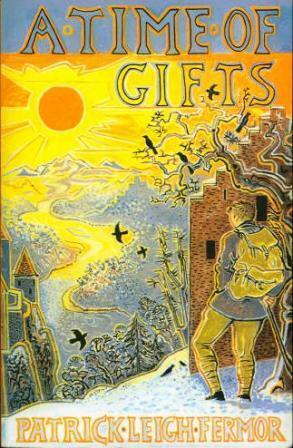 The book is described by Leigh Fermor himself as ‘nothing short of a masterpiece’, and he is right. It is a fabulous story: Bouvier is brilliant at describing his surroundings and their inhabitants. The two men are always dependent on the goodwill of those they meet and remarkably successful at acquiring it, especially given their frequent linguistic shortcomings. Midday: an onion, a pepper, hard bread and goats cheese, a glass of white wine and a cup of bitter, frothy Turkish coffee. At night: mutton kebabs, and the small luxury of a plum brandy under the sorb-apple trees, which hiked up the price of the meal a bit. Adding the excellent local cigarettes and postage, the two of us could live on seven hundred dinars (about £2 a day). Everything (in Prilep) that was misshapen, nauseating and deceptive would emerge with nightmarish clarity: the sore flanks of the donkeys, feverish eyes and ragged jackets, rotten teeth and those shrill, wary voices moulded by five centuries of occupation and conspiracies – right down to the mauve offal in the butchers shops, which seemed to be crying out for help, as though meat could die twice. Islam here? True Islam? It’s absolutely finished – even more so now that fanaticism has re-emerged, with its hysteria and suffering… Fanaticism you see is the last revolt of the poor, the only one that can’t be denied… A lot of things would be better if there were fewer empty stomachs. In the capital they manage to ingratiate themselves by accident with the Director of the Franco-Iranain Institute which leads to a successful exhibition of Vernet’s painting and some paid lectures from Bouvier. The lectures are on things like Stendahl the Unbeliever, a big hit it seems with the erudite Francophone denizens of Tehran. The person who had the tenancy of the Serai tea-house displayed an advertisment you couldn’t miss: a log across the road. We stopped – you had to – and then perceived beneath the canopy of dry leaves two steaming samovars between garlands of onions and teapots decorated with roses lined up on the brazier; inside we joined several other victims of the tree-trunk, who acknowledged us politely and at once turned back to their siesta, their game of chess or their meal…. The tea was boiling, the melon just ripe, the bill reasonable; and when we got up to leave, the proprietor rose and courteously removed his barrier’. Bouvier notes that Afghan hospitality is of the taciturn variety, the freak, he says, is the host who receives his guest and, in the words of a popular Afghan song, ‘kills him with questions from head to foot’. Our next writer, who we can join with a leap to the western edge of the country, encountered every kind of host during his remarkable travels in Afghanistan. The Places In Between charts Rory Stewart’s walk from Herat to Kabul, through the mountains, in winter. 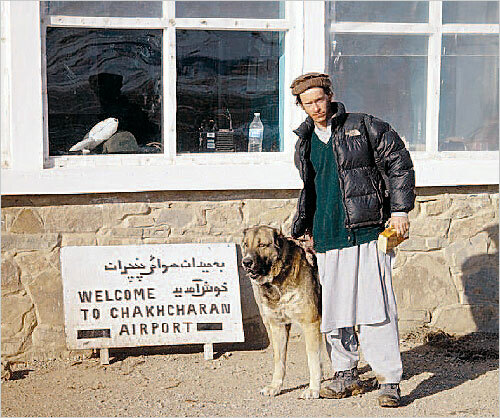 Stewart has spent sixteen months walking across Iran, Pakistan, India and Nepal. He has tried and failed to enter Afghanistan a year earlier but, undeterred, persists with his ambitions and finally gains access to the country in early 2002, at the point when control of the country has only just been wrested from the grasp of the Taliban. His first priority in Herat? Find a walking stick, of course, which he fails to do and so buys a wooden pole, seeks out a blacksmith, sketches a design for him, and comes away with a suitable dang, part broom handle, part reclaimed Russian armoured personnel carrier, hereby establishing his credentials as a man of resource, imagination and determination. In the winter of 1506 Babur, the first Emperor of Mughal India, walked the same route. Stewart uses Babur’s diaries to embellish his own, adding a depth of history to his tale and helping him in his quest to discover the secrets of this land ‘between the deserts and the Himalayas, between Persian, Hellenic and Hindu culture, between Islam and Buddhism, between mystical and militant Islam’. As he progresses, trying to maintain a rate of forty kilometres a day, Stewart is met with alternate incredulity and suspicion. He is saddled with unwanted ‘protection’ in the form of accompanying soldiers and further hangers on, people who slow him down, irritate him, yet intrigue and enlighten. As he travels, it becomes apparent that Stewart will take no nonsense, not even from his hosts. His Persian, learnt ‘through repetitive conversations in villages’ is good enough for him to argue and banter with the local men (he almost never meets women). When he feels his hosts are not co-operating, he is quick to remind them of their religious obligations: ‘ I have been traveling in Iran and Pakistan, where I was treated very well because Muslims know how to treat guests’ and remarkably, in a country where automatic weapons are discharged at the slightest insult, perhaps taken aback by his chutzpah, this approach succeeds. The bafflement provoked by this wandering foreigner only increases when he equips himself with a further companion, a four-legged one. The dog is missing his ears (‘so he could fight better’), tail and teeth (knocked out with a stone), has yellow eyes like a wolf and is ‘the size of a small pony’ but he nevertheless seduces the writer: ‘I couldn’t decide whether he was very depressed or very old or both. He looked over his shoulder and saw me. The stump of his tale moved slightly and he took a slow step towards me. I decided to take him back with me to Scotland.’ He calls the dog Babur, and describes him as ‘beautiful, wise and friendly. Afghans would only use such adjectives for a man, a horse or a falcon’. The route taken in this book encounters many historic buildings and monuments, some only sketchily know to western learning. Stewart is expansive on these place, collating all available knowledge, both local and international. Here Stewart describes stumbling across the Minaret of Jam, a mysterious relic of the little understood Ghorid Empire, in the middle of what may once have been the mysterious ancient city, the Turquoise Mountain. His book is studded with remarkable encounters like this and there’s much to learn from reading it though Stewart’s light touch with prose prevents the book becoming too heavily didactic. Babur’s response to the tower is to pee on it. All this time, traveling on ice and snow, Stewart suffers from intermittent dysentry and sustains his dog and himself on what is mostly dry bread. Yet still he records the details of everything he encounters, characters, conversations, archaeological finds, ethnic and religious tensions, the the outer ripples of the western military interventions just beginning. The aftermath of Taliban brutality abounds, particularly in the Hazara district. The town of Yakawlang, where he gratefully accepts hospitality from an outpost of Medicin Sans Frontiers, is little more than a charred shell of a place after the Taliban executed 400 men in 1998 and the remaining people either ‘died or fled’. It is now nearly a decade since Rory Stewart took his walk across this remarkable country. What has improved? The country is still torn apart by war, democracy continues to founder, Western troops still fight the insurgency across vast provinces. Stewart now sits in the House of Commons where we can only hope some of his wisdom, knowledge and humility can be made use of. He maintains his links to Afghanistan, particularly through the charity The Turquoise Mountain, an organisation dedicated to the regeneration and support of the country’s traditional arts and architecture.